Dr Fidelis Myaka, Project Manager for the Building capacity for Resilient Food Security project explaining the CSA practices selected and being demonstrated at the demonstration plot at Kilimbili village, Morogoro. 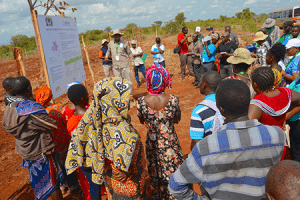 The training is part of the Building Capacity for Resilient Food Security project, an initiative of the Government of Tanzania in partnership with the USDA and USAID. The activity addresses capacity gaps to respond effectively to the challenges climate change poses to agriculture. The project is being implemented by IITA, the UN Food and Agriculture Organzation, and the World Agroforestry Center. Climate-smart agriculture is defined by FAO as agriculture that increases food productivity and farmer income, reduces greenhouse gas emissions, and is resilient to shocks and stresses from climate change. The approach helps the agriculture sector cope with climate change and associated extreme weather conditions such as drought, prolonged dry seasons, and floods, while also meeting the increasing demand for food. To request more information, please call the U.S. Embassy Dar es Salaam Press Office at tel: +255 22 229-4000 or email: DPO@state.gov.